Proven in the US for many years, JungleMulch rubber mulch is now available in the UK exclusively through PlaySmart. Made from shredded recycled tyres, meaning it is environmentally friendly, it is a water permeable safety surface with the look of natural bark. Rubber Mulch is available in a range of vibrant colour blends that stay bright because of our unique organic colouring process. Suitable for many uses, JungleMulch can remove the costly ground works typically associated with wet pour and is a cost-effective alternative to loose fill, being more durable with less maintenance required. JungleMulch rubber mulch is used in areas such as parks, play areas and public spaces and also on pathways, mounds, embankments and erosion control areas. We are also finding it is increasingly popular as a surfacing product for specialist sports such as golf pathways and even skate parks. The bonded rubber provides excellent slip resistance while being fully wheelchair and buggy accessible. We can install JungleMulch at a range of fully certified depths to provide fall protection to suit your requirements. Click the below photos to enlarge them. 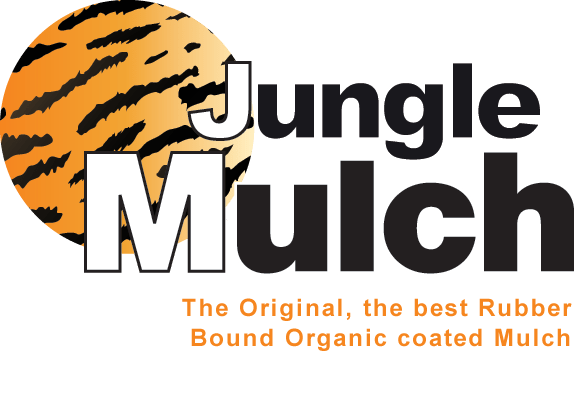 For more information on JungleMulch rubber chippings and rubber mulch, please download our brochure or visit our projects gallery. Alternatively, please contact us for samples or prices.